The Village of Metamora is a municipal corporation governed by a President and Board of Trustees, with the help of other officers and employees. 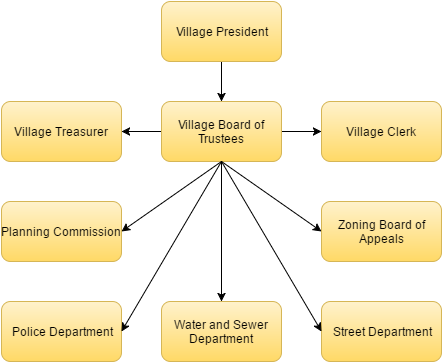 The Village government adopts and enforces local laws, builds and maintains local streets, operates the village water and sewer system and generally administers village services. Trustees: Don Hutchens, Bill Nauman, John Bockler, Charlie Kamm, Dave Vericher, and Rodney Thompson. Harland Sluga, Stanley Sayre, Joe Alig, Josh Ketcherside, and Rick McDonald. All requests for public records shall be in writing directed to the attention of the Village Clerk. Requests should be delivered or mailed to the Village of Metamora, Attention Village Clerk, and P.O. Box 1070, Metamora Il 61548-1070. No charge will be allowed for the first 50 pages of black and white copies, and 15 cents per page thereafter. If color copies are provided, the public body can only charge the actual reproduction cost.